Imagine the absence of noise and emmisions. Imagine sailing without wind in the new Eelex 8000. Travel up to 100 nautical miles on a single charge. Minimum footprint on the planet & your wallet. Uses a groundbreaking propulsion system. X Shore crafts are capable of traveling at speeds of 40 knots. A state of the art hull. The X Shore hull features a groundbreaking design that has been tested to optimize distance and speed by minimizing weight and resistance. The hull’s distinctive ridges allow for air insertion between the craft and the water, decreasing friction. These design improvements to the hull reduce energy use by approximately 35%. The minimalist design and flexible configuration of the Eelex 8000 offers a blank canvas for its owner to customize. A system of struts and rails makes it easy to secure different types of loads and to add or move seats. Additionally, the loading capacity is 2500kg, giving you the option to transport many passengers or haul heavy equipment. The distinct silhouette and wooden surface detailing of the Eelex 8000 provide a functional and easily recognized design that is undeniably unique. The high bow makes the craft safe and seaworthy, providing protection to passengers from wind and spray, as well as facilitating access from higher docks, while the lower stern allows the breeze to enter the boat freely and makes heavy loading and unloading easier. X Shore – ren och rätt på alla sätt. "Gamechanger. 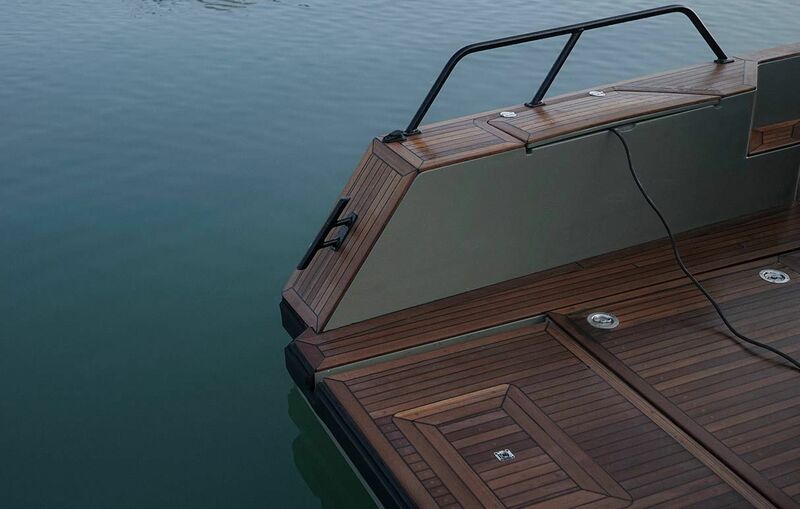 The eElectric signals the start of a new wave of hypermodern boats, to help the sea feel more tranquil again." "One boat that stood out at Palma De Mallorca Boat Show was the Swedish all electric boat X Shore eElectric, a slim, streamlined, environmentally friendly and functional boat for its element." 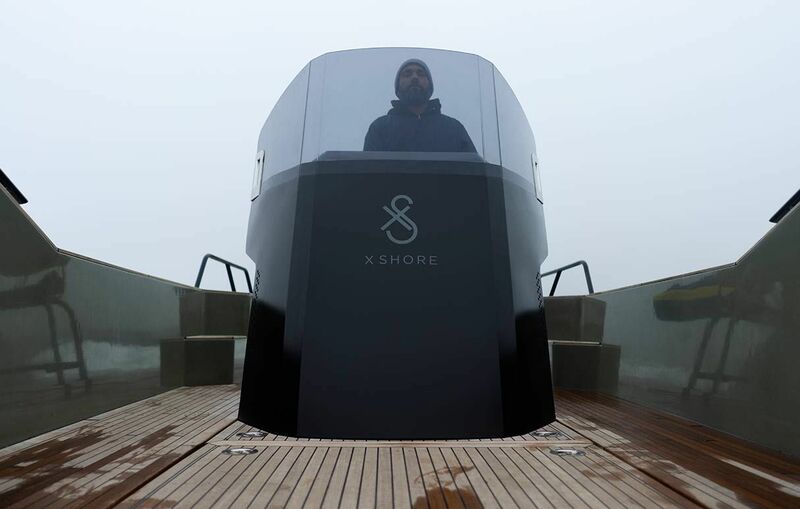 Through new technology, innovative research and smart design, X Shore will propel the maritime industry into the age of sustainability with climate smart crafts. The X Shore propulsion system is what sets it apart from other crafts. Through cutting edge engineering, its single shaft construction propels the boat with greater efficiency. More details regarding this innovative propulsion system are coming soon. Two battery choices are available, including 90 kWh and 120 kWh. Charge via dual (230 V/5 AMP) or triple (400 V/30 AMP) connections. The Smögen 8000 can be fully charged in as little as 8 hours, depending on the power source. Generally, the cost to fully charge an X Shore battery is comparable to the price of a lunch. Taking into consideration different prices of petrol all over the world, it is still a fraction of the cost to operate an electric powered X Shore craft compared to a traditional fossil fuel powered craft – with the added benefit of not contributing to pollution. Gone are the toxic fumes and disruptive noises associated with fossil fuel engines. Become one with nature through X Shore’s electric power. We can now offer customers a unique opportunity to sit down with our boat designers and engineers to completely customize your X Shore craft to fit any need. X Shore online craft builder. Customize and order your X Shore craft online. All above may be subject to change.